Last week’s attack on a BBC television crew in Hunan province, China, reveals once again the Communist Party of China’s brazen thuggery and out-of-control bullying. To physically attack a major foreign media crew, smashing their equipment, and then to force them to sign a confession is the most public example of what has been apparent for several years: Xi Jinping’s regime behaves more like gangsters than government. Yet just as the assault on the BBC helps highlight China’s aggressively repressive behavior toward anyone, Chinese or foreigner, deemed to dissent or threaten the regime’s interests, it is only the tip of the iceberg. If government-backed thugs can behave that way toward the international media, imagine how much worse it is for Chinese people. Since he became president, Xi has presided over a dramatic deterioration in human rights over the past four years. A major crackdown on human rights lawyers and activists; the destruction of crosses and churches in Zhejiang province; continuing persecution of Uyghurs, Tibetans and practitioners of the Buddha-school spiritual movement known as Falun Gong; new restrictions on civil society and the erosion of Hong Kong’s basic freedoms — all point to a situation that many dissidents describe as the worst since the Tiananmen massacre in 1989. Those who defend human rights and advocate for the persecuted – like lawyers Li Heping, Jiang Tianyong, and Wang Quanzhang – are themselves detained, tortured, and disappeared. In June last year, the U.K. Conservative Party Human Rights Commission published a damning report titled “The Darkest Moment: The Crackdown on Human Rights in China 2013-2016.” Speaking at the launch in Parliament were the former Governor of Hong Kong Lord Patten, Chinese-born Canadian actress and Miss World Canada Anastasia Lin, and Angela Gui, daughter of Hong Kong-based bookseller, Gui Minhai. Both Anastasia Lin and Angela Gui have first-hand experience of China’s bullying behavior. Lin, who has used her platform as an actress and beauty queen to speak out on human rights in China, was declared persona non grata and denied entry for the Miss World final in China in 2015. She then faced attempts to silence her at the Miss World final in Washington, DC last December. Last month, the Chinese embassy in London telephoned Durham University to urge them to withdraw an invitation for her to speak in a debate, a request the university rejected. Lin’s father, who lives in China, faces continuous harassment from the authorities. In October 2015, Gui Minhai disappeared from his holiday home in Thailand. Last Wednesday marked 500 days since his abduction. For three months there was no trace of him at all. Then, suddenly, he appeared on state television in China, confessing that he had voluntarily surrendered himself to the Chinese authorities in relation to an alleged fatal hit-and-run car accident that took place in 2003. Since then, his whereabouts have been unknown, he has been denied access to legal counsel, and his daughter Angela, a student in the United Kingdom, has not heard from him since June last year. In the first six months of 2016 she had just three very short telephone calls with him, in which he asked her – presumably under coercion to do so – to stop campaigning. Gui Minhai was born in China but moved to Sweden in 1988, gained permanent residency in the aftermath of the Tiananmen massacre in 1989, and became a Swedish citizen in 1992. He lived and worked in Sweden and Germany, before moving to Hong Kong in 2012 to establish Mighty Current Media, a publisher and distributor of books on mainland Chinese politics and the lives of Chinese leaders. It is believed that his publishing work is the real reason for his abduction, along with the disappearance from Hong Kong of four of his colleagues. Yet while the other four – Lin Rongji, Lu Bo, Zhang Zhiping, and Lee Bo – all returned to Hong Kong last year, Gui Minhai remains in detention in China. What is particularly disturbing about Gui’s case is the comparative silence of the international community. Sweden says it is working to secure his release but so quietly one would not know. The British Foreign Office refuse to meet Angela – presumably using the excuse that as Gui Minhai is a Swedish national, it is a matter for Sweden to deal with. And with the exception of PEN International, of which Gui was a member, major human rights organizations have been reluctant to take up the case, due to lack of information. China, of course, is intentionally withholding details to make advocacy more difficult. 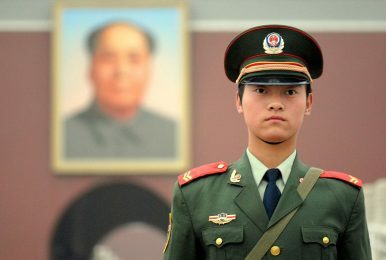 China has long had a poor human rights record. But in abducting foreign nationals from foreign shores, it has gone too far. The international community must end its kowtowing to Beijing, which China does not respect, and instead speak out publicly for people like Gui Minhai. If governments were not prepared to do so previously, perhaps the assault on the BBC may serve as a wake-up call. Benedict Rogers is a human rights activist and writer based in London. He is Deputy Chair of the Conservative Party Human Rights Commission.